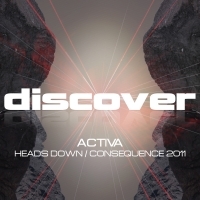 Activa has been a busy man this year taking over as head honcho at Discover together with a steady stream of singles and preparation for his eagerly awaited second album "To The Point". With this release he shows no sign of taking his foot off the gas as he delivers another perfectly crafted two tracker. Heads Down already looks set to become a future Discover classic with both the single and the album version quite literally ticking the Discover "Heads Down" box! Consequence is a remake of the 2006 track originally released on Enhanced and brought bang up to date with this 2011 rework. Watch out for the new album "To The Point" - released on CD and Beatport exclusive on 10th October 2011 and full digital on the 24th October. 'Heads Down / Consequence' is available now from Beatport and iTunes.